Cool bottle, cool label. The contents? Also pretty good. Oh wow – just wow. 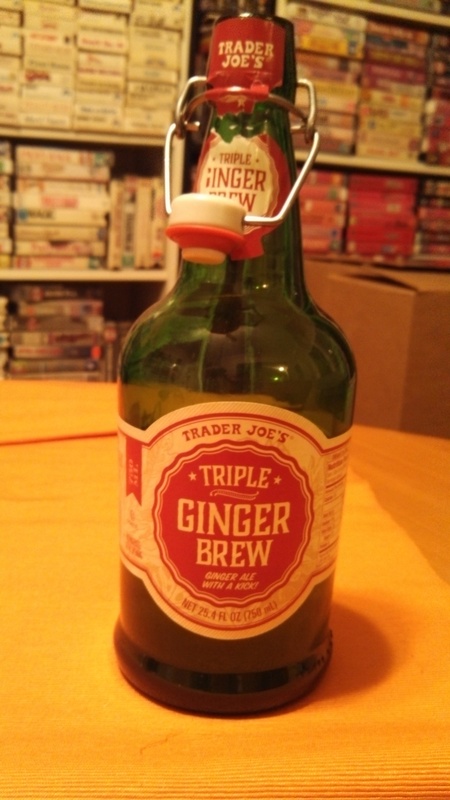 I think I may have dreamed of something like Trader Joe’s Triple Ginger Brew at some point, but never did I imagine it would be made a reality. A strange but non-alcoholic beverage, bottled in a giant, green glass jug with the sort of stoppered cork that makes you feel like an old timey sailor, sold at rock bottom prices? There was no way I wasn’t buying this the second I laid eye on it. Even better, if Trader Joe’s marketing copy is to be believed, this was a product that they felt compelled to make from scratch. On their website, Trader Joe’s states that they simply could not find a drink with enough ginger in it to suit their tastes, so they made their own. Really? Out of all the outlandish products that people might hypothetically be hankering for (pizza bagels the size of a real pizza, ice cream sundae pies, etc) TJ’s decided to hitch their horses to a Triple Ginger Brew? Now that’s a level of unorthodox thinking that I can really get behind. While I certainly like that Trader Joe’s went and threw the word “brew” in there, what we’re basically talking about here is a ginger ale. A super intense ginger ale that comes in a giant, re-corkable jug, but a ginger ale nonetheless. Look, I’ll level with you there, they had me at the bottle. It didn’t matter what they put in there, – super intense ginger ale, regular ginger ale, a different type of ginger ale – anything, I was going to buy it. A bottle with such cool, classic styling just doesn’t come along every day. Owning a bottle like this is like getting an honorary degree in Cool from Rad University. Basically, I would recommend you buy this product on strength of the bottle alone. The fact that a tasty beverage can be found in the bottle is really just icing on the cake for me. I say “can be” found, because you opinions on this brew are based entirely on your fondness for ginger. I really like ginger. I always put extra ginger on my plate at sushi restaurants, I sometimes buy crystallized ginger to snack on, and when offered a choice between a ginger snap and a thin mint I’ll take the ginger snap every time. In other words, when Trader Joe’s set out to make a super gingery brew, I was basically the target demographic. On the other hand, if you hate ginger and the thought of it makes you gag, you might want to consider not buying this product all that often. For ginger fans, there’s a lot to love about this drink. What’s particularly nice, is that they upped the ginger flavor, not the sugar, so unlike some other ginger ales on the market, it’s quite mild. This really lets the ginger come to the fore or, more accurately, the rear. A gulp of triple ginger brew rolls quite easily across the tongue, only to light up the back of the throat and tongue with that warm, tingling, searing feeling. In terms of potency, the brew is almost as strong as Reed’s very potent Jamaican-style Extra Ginger Brew, although it should be noted that Trader Joe’s bottles theirs in 750ml bottles which, at the price of only $2.99, makes it the clear winner – no matter how strong you like your ginger ale. In my opinion, the bottle alone is worth at least that much. Would I Recommend It: Yes, if for the bottle alone. Would I Buy It Again: I might step out for some right now. Final Synopsis: Super strong ginger ale in a super cool bottle. TJ’s Triple Ginger Brew is greatb stuff! I regret that I only bought three bottles when I first found it because, on a recernt return visit to my TK store (Portand, Maine — a 100+ mile round trip from mty home) it was nowhere to be found. I’m hoping that this was only a temporary glitch in their distribution and not a withdrawal of the product. Wow, sounds good. What goes into a Gingerosa? Based on the taste and ingredients list, I’m pretty certain this is just Reed’s rebranded. Not a bad thing, Reed’s is great. It might be made by Reed’s (TJs does stuff like that with their store brands) but it is definitely not the same as the regular Reeds. Much more ginger, much less pineapple taste– This brew is something extra special. This stuff is AWESOME, but I hate to just recycle the cool bottles. Anyone doing something with them? My family uses them to store drinking water in. We peel off the label after the ginger ale is gone. In the summer, it’s easy to pop these inthe fridge for chilled water. They are easy for my kids to pour from, we keep a few on kitchen counters and dining table. Great alternative to a large unwieldy jug or plastic. diploma and donated some goodies as well. This manager has a grate communication skills,he is bilingual, kind, very professional. Trader Joe’s policy has being great. Congratulation and thank you very much, because your store is involves with our community. I love this ginger beer but I am trying to find out if it is definitely gluen free?